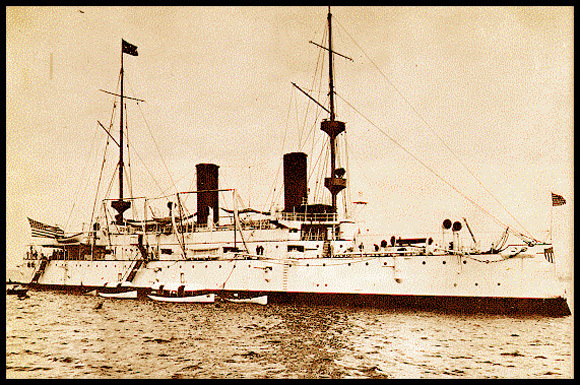 This image is of the Cruiser OLYMPIA shows her in the configuration which have been seen at the Battle of Manila Bay, May 1, 1898. The observation post built over top of the forward conning tower is clearly visible. The ship is no longer in her wartime paint of slate gray however, but is now repainted peacetime white with buff funnels and masts. The image is clearly after the war, as evidenced by the Admiral's pennant seen flying from the mainmast. George Dewey was appointed Admiral of the Navy on March 2, 1899.